I have started this thread to show an air tool hanger I made. I am not suggesting that it is the best or the only way to make one. This is just to help or motivate others. Experts will find this boring. Every time I start another project I use a bunch of air tools. These air tools balance on any horizontal surface until bumped. This sees them crashing to the floor. These are not all my air tools but just the ones that are used in welding often, often enough to never see them back into the tool cabinet. Today I was sick of moving them out of the way so I decided to make an air tool hanger. My version. I only add a mount when I add new air tools that way I know if something is missing. Looks like a display are a tool store! I can not imagine having all those air tools getting in the way on your bench. 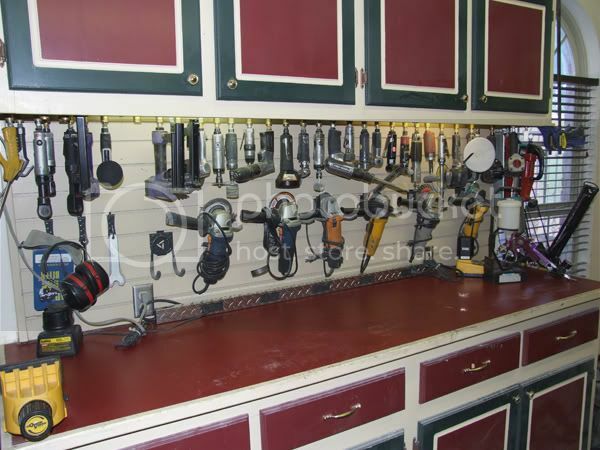 Thanks for posting the photo and sharing your tidy work bench. It not only looks great but works well and I bet it did not cost much either. Jiginator, I only see the pics of the air tools. I used cheap harbor freight quick connects. I cross thread a fine thread bolt in to it, that worked like a lock nut. (note The threads in the quick connects are pipe fitting threads). It also makes a great way to oil the tools and not worry about dust or oil leaking out. I got tired of spending more time looking for the tools than actually using them. Yes I was about to post the whole thing but got dragged away. My hanger will be fixed under a metal shelf so I need a beam. I purchased a 25 x 25 x 3mm or 1" x 1" x 1/8" aluminium square tube. I also purchased some female Nitto air tool couplers and some 1/2" UNF 20 1 1/4" bolts. These are the main parts that were required. I marked out the layout onto the Ali tube and drilled some large holes so the bolts will past right through. With a drop of locktite on the bolt ends feed them through the holes and tighten the female Nitto couplers. If all has gone well they should all line up. I then fixed the square tube to the metal shelf. Time for a test fit. I have room for more air tools on the tube but I will wait until the Nitto fittings are cheap again. Air tools off the bench in under an hour. As Smooth wrote It takes more time to find them sometimes than that. That looks great! Thanks for the post. This will be copied! My work shop is starting to get real easy to use finally. Every thing has a place and everything is in its place. I might even start sharpening my old drill bits. So, if you had to do it again would you have done it all the same? Any different spacing or anything? I'm getting ready to do that for my 4 or 5 air tools so just thought I'd ask.